The power is back on in Moosomin, but SaskPower says large sections of the province are still without electricity Tuesday morning. The ​Crown utility is experiencing numerous power outages in different areas of the province. Much of the city of Regina is without power. A large area is impacted in regions just south of Prince Albert stretching east of Porcupine Plain and then down to the Yorkton region. 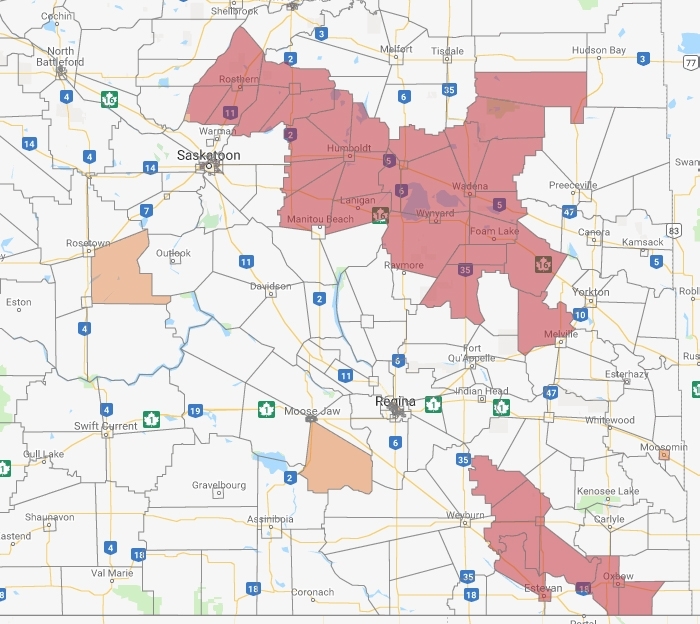 There is another large swath of power issues in the Weyburn and Estevan regions. SaskPower is scrambling on two fronts to get back power, said spokesperson Jordan Jackle. First, it's trying to assess who in the province is without power. Second, it's trying to figure out what knocked out large sections of the provincial grid. "We know that the frost in the past number of days has had a pretty significant impact on our infrastructure out there. We're starting with that, working back from that," he said. "It has an impact on power lines, causing them to break and droop and impact other equipment that they're attached to." Jackle said some of the assessment can be done by computer in Regina, but he said there's really no substitute to getting crews in the field to observe and examine equipment. He said that anyone who has lost power should call the outage line at, 306-310-2220. Jackle said this is key to helping the workers pinpoint the areas affected. In Moosomin, scheduled outages are planned through the week. Residential SaskPower customers in the town of Moosomin will see power out for half an hour. Each home should face only one outage through the week.